Engaging in climate action through integrated sustainability strategies and planning is more effective than compartmentalized approaches. Systems modelling exercises can support such integrated planning efforts because they have the ability to elucidate relationships and outcomes of social and physical infrastructure decisions. However, there are challenges associated with both the modelling process and applying the modelling outcomes. For the former, deciding what to include in models presents a significant challenge: including all aspects of a community and local environment is unfeasible, whereas including too few aspects leads to a non-representative model. For the latter, outcomes of systems modelling can be somewhat abstract to users in the sense that the output may not provide stakeholders and community members with a strong impression of how certain modelled scenarios would look and ‘feel’ if implemented locally. The Spaces, Places and Possibilities research project aims to address these challenges by incorporating community participation and visualization in a community systems modelling effort. 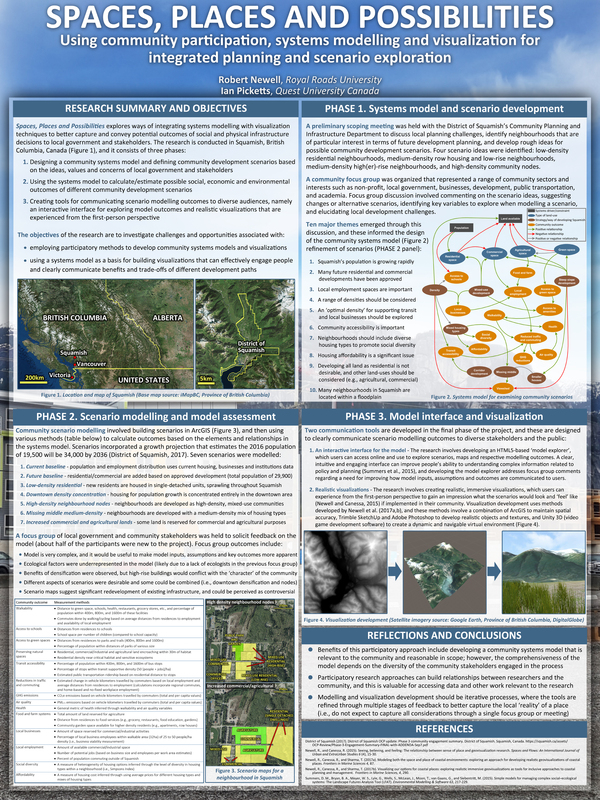 Conducted in Squamish (BC, Canada), the project consists of three phases: (1) model and scenario development, (2) scenario modelling, and (3) scenario visualization. Phase 1 involved a focus group that represented diverse sectors/interests in the community, which was assembled to discuss local issues and possible futures for Squamish. Focus group data were analyzed using NVivo, and the results of this analysis informed the design of a community systems model and local development scenarios. Outcomes of this phase included a reasonable scope for modelling work and a systems model that captured a comprehensive range of key local interests and values. Phase 2 applied the systems model in an examination of four different community development scenarios: low-density residential, mixed housing types, high-density neighbourhood nodes, and increased non-residential lands (i.e., commercial and agricultural). This phase was executed primarily using ArcGIS and Excel, and the modelling explored a variety of factors (e.g., access to amenities and education, walkability, parks/trails, food and farm systems, public transit, housing affordability, neighbourhood social diversity, and threats to critical habitat). Outcomes from Phase 2 provided valuable insights on how certain ways of developing the community can contribute to mitigation, while also resulting in social, economic and environmental co-benefits. Phase 3 (ongoing) involves building a realistic visualization that depicts the scenarios created/explored in the first two phases and allows users to experience and navigate these scenarios from the first-person perspective. The visualization development uses a combination of ArcGIS, Trimble SketchUp, Adobe Photoshop, and the Unity 3D gaming engine to (respectively) maintain spatial accuracy, develop realistic objects and textures, and create a dynamic and navigable virtual environment. Due to its realism and first-person perspective, the visualization has the ability connect with the sense of place of the user and provide a vivid impression of how one would feel about a particular development scenario it transpired in the real world. In this way, the visualization can add salience and place-based meanings to the (otherwise abstract) output produced through the modelling work, thus allowing the user to better understand local implications of mitigation and sustainability strategies.